Buff Ducks from Barn World! Barn World is now offering Buff Ducks! 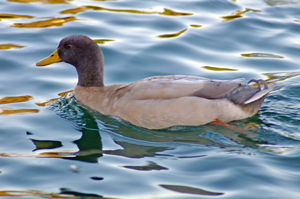 These popular ducks are great for egg production and eating. Called a dual-purpose breed, they have been known to lay up to 200 eggs per year. William Cook fro Kent, UK is credited with the breed and they were introduced at a show in Islington, London in 1897 and admitted to the American Poultry Associations Stand of Perfection as the ‘ Buff Duck’ in 1914. Originating from the same home as the chicken breed of the same name at the world famous Orpington Farms in England, they are also referred to as Orpington Ducks. The males are the same color as the females with the exception of the Drake’s head with blends into beautiful brown. Weighing up to 7 lbs, the hens are great layers and are about one pound lighter than the males. This breed is found in nearly all wetland habitats and eat a wide variety of insects, seeds, larvae, vegetation and grain. Usually a surface water filter-feeder, they will occasional dive for vegetation in shallow water. A great breed for anyone just starting out, they will arrive in their specially designed container, comfortable and ready to explore their new world. Quick to feather out near only three months, they are considered to be a ‘smart’ breed and are a joy to have as pets or as producers. Available hatch dates are from June, right on through September and orders ship within three days from BarnWorld. Barn World is your home for all your livestock supplies, including everything from cattle guards to electric fencing and of course, a wide selection of ducks! Call them today at 720.238.2190.